Learning for Living Foundation makes sure that more than 100 kids’ minds and bodies are fed. I can’t say that I’m a serial giver, but there are certain foundations and causes that are very dear to my heart. 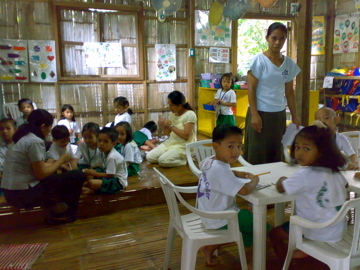 One of which is the Learning for Living Foundation in San Jose Rodriguez, Rizal. Running solely on donations this school/feeding program started by big-hearted Canadian lady Patricia MacAuliffe is perpetually on “survival mode”; meaning they always have to work hard to get funds on a regular basis in order to keep afloat. This morning when I called for an update MacAuliffe happily told me that they started a new schoolyear with 170++ enthusiastic kids but, because of teacher salaries, they may not have enough food for their feeding program for the end of the month. Just for the feeding program they need at least Php 4000/month which is Php 800/day that already includes a budget for rice and gas. MacAuliffe makes sure that their meals consist mainly of vegetables and fish while meat and fast food are kept to a strict minimum-which is rare for most filipino diets. To give a quick breakdown, to keep ONE kid in school costs Php 10,000 a YEAR which is Php 833 a month! So this blog is a quick shout out to anyone and everyone who would like to make slight difference in a kid’s ( and his or her parent’s) life. Plus, you can be sure that you will get regular reports of where your money is going ( I have decided to donate a minimum amount on a monthly basis) as Learning for Living can issue receipts and you can always go and visit the facility in San Jose, Rodriguez in Rizal. To make an appointment to visit or to get more information call (02) 948-4415. Donations can be made via their peso account: Learning for Living Foundation Inc. BPI Family Bank, acct # 5843-1609-31 or through their dollar account BPI Family Bank # 687-400-5191. I know everyone must have their own charities of choice but this is a chance to also contribute to the growth of a small community month after month so giving is a consistent regular thing, rather than just giving and forgetting. I do hope that even spreading the word about this program to other interested parties will help, as money is something that they are in dire need of for the near and far off future.